1. Why did white farmers want to use African slaves? 2. How did Europeans get slaves from the African tribes? 3. List some of the challenges that Africans faced on the slave ships. Plantations: large farms or estates, where cotton, tobacco, coffee, sugar cane, or the like is planted, usually by laborers. First, they forced the native people (Native Americans) to work as slaves. 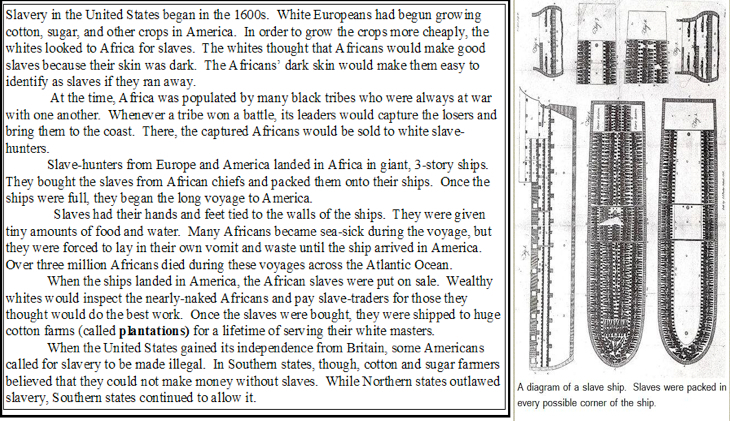 Then, they started to use Africans as free labor (slaves).10-12 million Africans came to the colonies to become slaves. Slavery happened within Africa, too. Often prisoners of war were sent to become slaves. 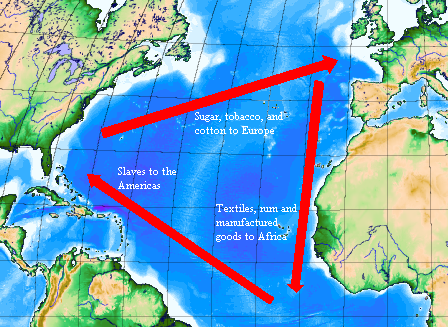 Because trading slaves became profitable, it was difficult to stop this system. Captured people walked together in trains for many miles. Slaves had to stay in the hold area of the cargo ships which was dark, crowded and dirty. The Middle Passage took about 62 days (that’s about two months). Life on the ships was terrible. Each person only had 4-5 feet of space. Most people couldn’t even stand up straight. The crew on the ship wanted to keep the Africans alive (no one would pay for a dead slave) so they forced them to eat, dance and sing. Most Africans were taken from their families. People from different parts of Africa spoke different languages so many people didn’t understand each other. 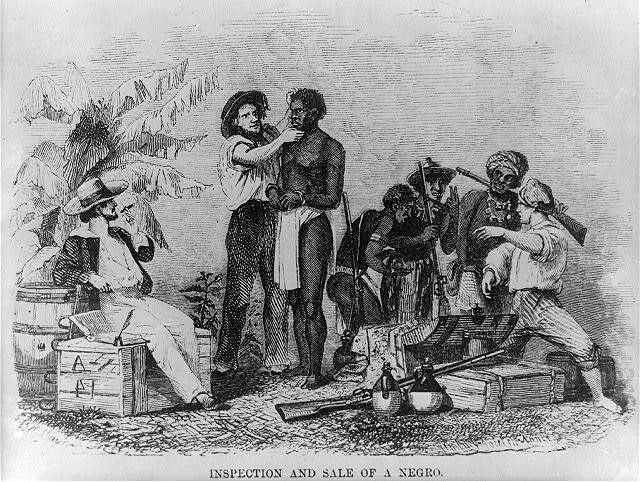 Captured Africans were treated as if they were property and were given a price and then sold during auctions. Often, people didn’t buy whole families so people were split up. 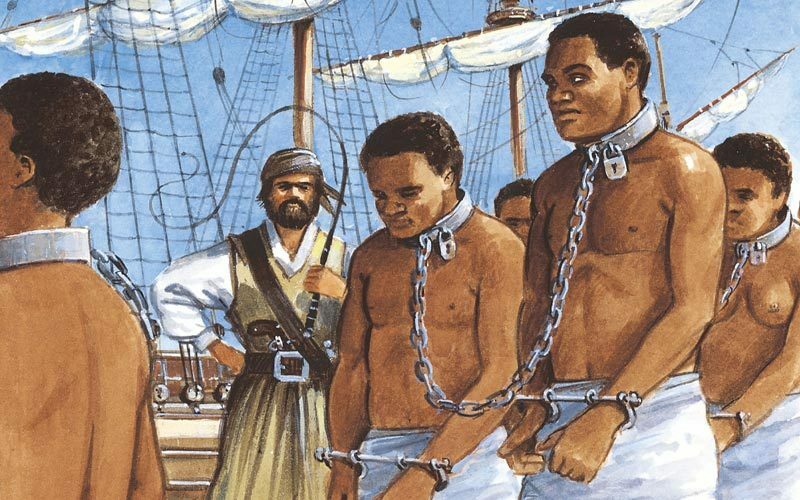 In the 1700s people started to question the idea of slavery and think that it was wrong. en of slaves remained slaves. Spectrum: Where does your opinion Lie? Think back to where you placed your name on the spectrum in class about laws always being good for everyone or never being good for everyone. 1. What law in today’s society that you think is good? Why do you think it is good and who is it good for? 2. What is a law in today’s society that is not so good or hurts some people? Why do you think it is bad and who is bad for?